A U.S. Coast Guard crew evaluates the seaworthiness of the the Claud W. Somers for passenger operations. REEDVILLE—The Chesapeake Bay Skipjack Claud W. Somers, owned and operated by the Reedville Fishermen’s Museum in Reedville, recently achieved final approval from the Coast Guard to resume full passenger operations. Made possible by fundraising the previous season and a grant from the Dominion Foundation in the spring, the process was begun in May 2016 when the Somers was hauled out of the water at Cockrell’s Marine Railway, reported. After a detailed out-of-the-water inspection, some rot in the stem was identified which required demolishing much of the bow section of the vessel and then rebuilding it, said Ridgely. The staff at Cockrell’s Marine did an excellent job of reconstructing the stem and putting her back together with the Coast Guard approving each step of the process. While in the boatyard, the crew also put in hundreds of hours of volunteer labor to repair, fabricate or replace other areas of the vessel that needed attention, added Ridgely. 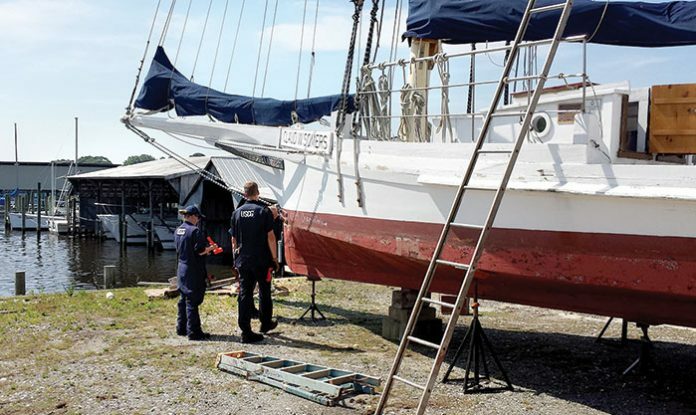 At the end of August, the Somers was relaunched and, after a brief visit to the Turkey Shoot Regatta on the Rappahannock River, began the third phase of the inspection process. This was a full evaluation of safety equipment and procedures, as well as a practical man overboard drill where the crew had to recover “Oscar,” the Coast Guard’s simulated man overboard. During the inspection process, a faulty tachometer on the Somers yawl boat, otherwise known as a push boat, was identified, she said. Omega Protein donated the time of one of their mechanics to trouble shoot the problem and then donated a new tachometer to rectify the problem, said Ridgely. At the follow-up inspection on December 28, the Coast Guard confirmed that everything was in good order and ready to go. The Somers was built on the Eastern Shore of Virginia in 1911 by Tom Young and worked as an active oyster boat for decades before being donated to the museum in 2000 by the family of Alfred Lambert. The Somers is listed on the National Register of Historic Places and the Virginia Historic Landmark Register. The Claud W. Somers will begin scheduled trips and be available for charter beginning in June.